If you told me a week ago that there was a powder compact costing US$420 (RM1,458) I’d have laughed in your face. But don’t laugh at me, because I’m going to show you a $420 compact powder – no kidding. This compact powder is by Chantecaille and is a Limited Edition item. 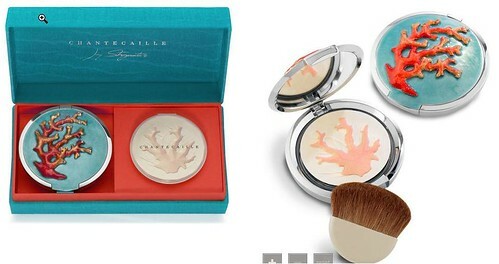 It is called the Chantecaille Jay Strongwater Coral Compact and you can read about it on Neiman Marcus. Here’s the extract for those who can’t view the site. As seen in Elle magazine (May 2007 issue, pg. 205), Bazaar magazine (June 2007 issue, pg. 84) and Allure magazine (June 2007 issue, pg. 56). Contributeâ€”one compact at a timeâ€”to a better world. A collectors’ limited-edition compact designed by Jay Strongwater for Chantecaille, hand lacquered with a beautiful coral relief decoration. The compact includes a flat, semi-circle natural hair brush and is refillable. Comes in an elegant turquoise and coral-colored cloth box with a refill. The Vitamin C-infused powder has velvety texture that glides on effortlessly, melting to skin for a natural glow. Silky soft, the extremely tiny, smooth particles result in a non-powdery finish. Treats skin with hydrating properties; imparts a sun-kissed, luminous look. Chantecaille’s Coral Collection supports “Reefs of Hope” a project of the Pew Institute for Ocean Science. Led by Professor Andrew Baker, the project seeks to mitigate the detrimental effects of pollution, over-fishing, and global warming on the world’s invaluable coral reefs. These complex ecosystems serve as an essential infrastructure maintaining the integrity of our coastlines, as buffers holding back tidal waves and regulating other extreme weather conditions, and as home to fish that provide nearly two-thirds of the protein intake to developing coastal nations. The loss of these vital reefs will have potentially devastating effects on both animal and human populations around the globe. A portion of the proceeds go towards the “Reefs of Hope” to aid in the preservation of coral reefs against the detrimental effects of global warming. I’m not sure how much goes to charity, but I was told its only about $30 out of the $420 which is pretty paltry. I’ve heard of Chantecaille and their prices are usually on the steep side, but $420 for a compact + refill really takes the cake. The good news is that the powder is available separately in a less fancy compact case for about $69 (still steep) but that’s quite a normal price for Chantecaille. I’ve been wanting to try Chantecaille for a while, and actually saw it in Hong Kong. However, the prices are prohibitive. Maybe some day I’ll try them. I’ve heard some good things about them. Till then, all I can do is drool over how pretty their stuff are. Very pricey, USD420 can buy many many wonderful compact powder in strawberrynet:-)I wonder the claim that they support the Reef Conservations is a half hearted claim or just a gimmick to justify their price tag. PB says: US420 can get me heck of a lot of stuff! Someone told me only $30 was going to the Reef Conservation. But its sold out so I guess someone’s buying it! man. i cnt imagine myself buying this thing, it will rip me apart! anyway i just can’t justify the price of this. PB says: I don’t know who can except maybe those who are rolling in it. I love the packaging but $420 ah – I rather go splurge on a designer bag lah 🙂 Thanks for the info… I will check out the products.